Council House Street, now gone, was the central thoroughfare of the old Pier district. It was wide and margined by houses which, two or three centuries ago, must have been occupied by the leading men of the town and port. The name of the street is, obviously, derived from the council house, which stood at Its south-east comer. Here the Dover Harbour Commissioners held their meetings for some two hundred years. In more recent years they often met at the Lord Warden Hotel or in London, but the official board room was here, containing the simple old-fashioned armchair in which the great Duke of Wellington used to sit when he presided at the Harbour Sessions. In 1832 the Harbour Board opened other offices for the Harbour Master, with a Board Room, at New Bridge House which, from 1865 to 1932, was the National Westminster Bank. Later the Board moved again to premises on Marine Parade and Dover Corporation took over the New Bridge premises. Except for short intervals, the Council House Street building was for years the residence of members of the Iron family, who, in succession, have been Harbour Masters. At the entrance to Council House Street was for many years a central ornamental lamp, with a drinking fountain at its base, presented by Mr R. Hesketh Jones, JP, in 1860. It was in Council House Street that Mr John Trevanion, MP for .this borough, established a school for the education of fifty Dover boys. In Council House Street there was also founded, in 1853, the Dover Sailors’ Home by the Rev William Yate, who, as minister of St John’s Mariners’ Church, was Dover’s sailors’ friend. After conferring with Captain W. H. Hall, RN, Mr Yate started the home, in very humble premises, in Council House Street, on the 1st of January, 1853, several ladies of Dover having guaranteed the first year’s expenses. It became so useful that a large permanent home soon became necessary. For that purpose, the Harbour Board gave a site off Blenheim Square, the Corporation of Dover surrendering a small piece of the Square in order to give greater depth to the building. In June, 1855, the president of the Board of Trade Mr E. P. Bouverie laid the foundation stone, and Mr Philip Stiff, the contractor, finished the structure in about five months. The home existed in these premises until 1923, when it was transferred to the Dover Patrol Hostel in Wellesley Road, at the comer of Liverpool Street. Blenheim Square, till 1934, was the derelict area that could be seen from the Viaduct close to the disused building of the Sailors’ Home. It obtained its name about the same time that the Sailors’ Home was founded. The name was in honour of HMS Blenheim whose captain, W. H. Hall, and officers and crew presented the town with a Russian mortar they captured at Hango, in 1855. The mortar was placed in the centre of the square but later moved to a site at the comer of Liverpool Street where it stood in front of the Dover Patrol Hostel. Previously Blenheim Square was called Red Pump Square because of a red pump which stood in the centre of it. How long the pump had been “red“ does not seem to have been recorded but the pump itself was quite an old institution, for, in a plan of Dover dated 1737, the pump is shown in the square. 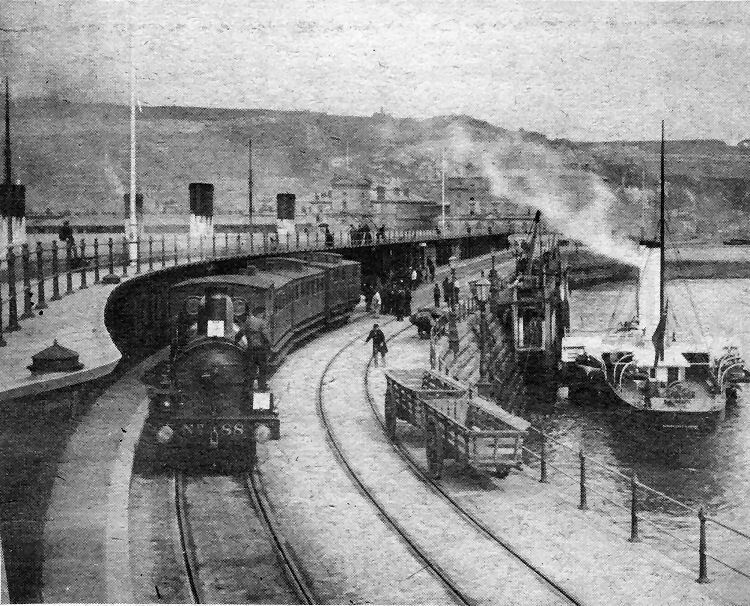 An 1866 Neilson-built locomotive, originally named Clyde but later having only the number 88, stands at the Admiralty Pier platform with a four-carriage train, between 1886 and 1887. The small locomotive was a 0-4-2 tank engine with 5ft 6in driving wheels. At the inner berth is the Maid of Kent (I), built by Samuda in 1861 for the Jenkins and Churchward fleet and taken over by the London, Chatham and Dover Railway in 1864. She was one of four sister ships, each with 1,000 hp engines, the others being the Breeze, Samphire and Wave. Over the parapet can be seen the four funnels of the doublehulled cross-Channel steamer, the Calais-Douvres (I), built by Leslie, or Hebburn, In 1878. Partington’s billposting of advertisements was a once colourful feature of this comer of the Pier District between Beach Street, to the left, and Seven Star Street. 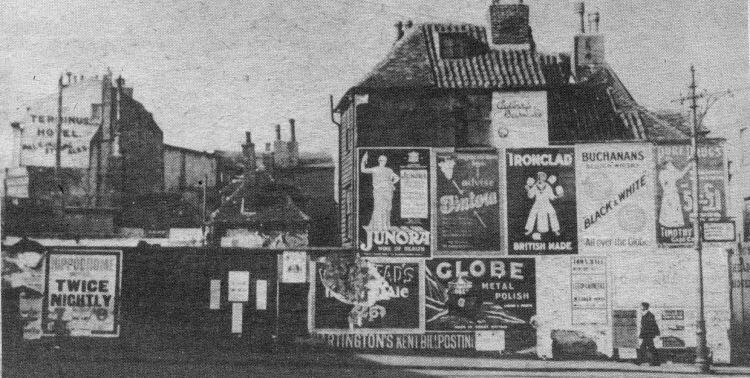 This Amos photograph, dating from about 1912, also shows the flank-wall advertising of the old Terminus Hotel, in Beach Street, one of the posts carrying the overhead tramway powerlines and part of the ancient King’s Head Hotel, in Clarence Place, on the extreme right.